Clifton are hoping to make it back to back derby victories to start the National Two South season when they entertain Dings Crusaders on Saturday. Matt Salter’s side edged past local rivals Old Redcliffians last weekend and are now aiming for a second successive win over one of their fellow West Country sides. There is also another derby taking place this weekend as Tonbridge Juddians and Canterbury do battle in Kent with both sides aiming for the early season bragging rights. Elsewhere in National Two South, early league leaders Old Albanian host Bury St Edmunds as Gavin Hogg comes up against his former club while two of the possible promotion contenders, Redruth and Taunton Titans, meet at the Recreation Ground. Also in Round Two, Rams FC travel to London Irish Wild Geese, new boys Barnes will be aiming to build on their opening day victory when they visit Henley Hawks while Birmingham and Solihull host Old Redcliffians and Guernsey go in search of their maiden victory against Worthing Raiders. Old Albanian got their National Two South campaign off to the perfect start as they swept aside newly promoted Guernsey at Woollams. OAs were relegated from National One in April, but it didn’t take long for them to find their feet in this division and they will be hoping to make it two wins from two this weekend when they host Bury St Edmunds. This Saturday, current OAs head coach Gavin Hogg will be coming up against his old club for the first time since leaving The Haberden in 2017 and a lot has changed at Bury since then. After beginning last season with Ollie Smith at the helm, he was replaced by Jon Curry back in March and the former Northampton Saints academy coach guided the Wolfpack to eighth place. Bury begun this season with a frustrating defeat against Henley Hawks, but a victory against one of the title contenders would certainly put last weekend’s loss to one side. Taunton Titans have hit the ground running. Tony Yapp’s side completely dominated Worthing Raiders in Round One as the possible promotion contenders got off to a flying start. 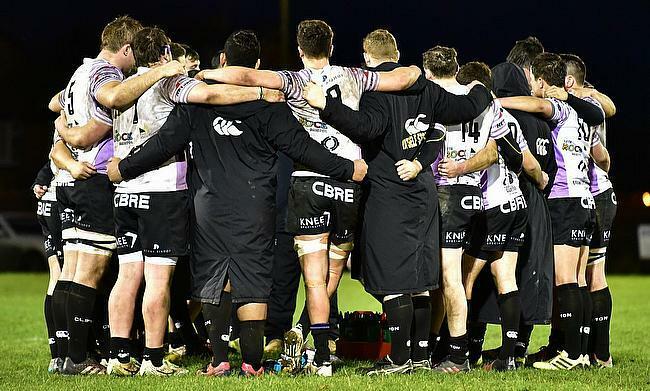 What is key for Taunton is that they remain consistent throughout the year, rather than just at the beginning of the term, and they travel to Redruth this weekend aiming for another positive result. Both Taunton and Redruth flirted with the possibility of a top two spot last year so it will be interesting to see if they can take the next step this term. Like the Titans, Redruth also began the new campaign with a victory, but they were made to work hard for it by newly promoted Dings Crusaders. The Reds are back on their own turf this Saturday where they lost just twice last season so they will be aiming to make the Recreation Ground a fortress once again. Last year’s bronze medallists Rams FC laid down a marker in Round One as they thrashed Canterbury at Old Bath Road. Seb Reynolds’ side completed their victory with minimal fuss and look like a side determined to take another step in the right direction. In contrast, it wasn’t the start London Irish Wild Geese were looking for. After avoiding relegation last term, the men from Hazlewood lost to National Two South new boys Barnes on the opening weekend so they will be keen to provide a response in front of their home crowd in Round Two. The Wild Geese have the quality to stay clear of trouble this term, but key to that could be getting some early wins on the board. It couldn’t have gone much better for Barnes and new head coach Joe Gray in Round One. After sealing the London and SE Premier title last term, Barnes returned to this level with a bang as they defeated London Irish Wild Geese to kick off the season. With Barnes gaining promotion and Wild Geese fighting off relegation in 2017/18, that result could prove vital as the season pans out. However, there is still a long way to go and up next for Barnes is a trip to Henley Hawks. Nigel Dudding’s men were clinical last Saturday as they beat Bury St Edmunds and they will be looking to double their tally of victories on their return to Dry Leas as they aim for consecutive wins for the first time since January. Tonbridge Juddians were one of the new arrivals to National Two South last season and it was one of this year’s promoted sides that caused them problems in Round One. Peter Dankert’s men had to battle hard, but eventually secured a narrow win over Birmingham and Solihull to begin the new campaign with a victory. TJs may have worked on ironing out a few creases this week as they prepare to take on Canterbury in the Kent derby this Saturday. The hosts began the season with a humbling defeat away at Rams FC so Andy Pratt and his side will be itching to set the record straight on their own patch. In this corresponding fixture last year, Canterbury lost 22-19 so they will be keen to regain the bragging rights this weekend. As Bristol Bears kicked off the new season with a win over their local rivals Bath in the Gallagher Premiership, Clifton did the same in National Two South. A narrow victory over their West Country counterparts Old Redcliffians gave the Lavender and Blacks a positive start to the campaign. And the title of the best team in Bristol in National Two South is up for grabs again this weekend as Clifton welcome Dings Crusaders to Station Road. Dings certainly gave a good account of themselves in Round One against Redruth and Luke Arscott’s side will be keen to produce a similar display when they take the short trip via the M4. Dings lost 40-19 the last time the two sides met in a competitive match in January 2015, but the Crusaders will surely be a tougher task for Clifton this time around. As we mentioned above, Old Redcliffians began the new term on the wrong end of a 17-14 result against Clifton. After escaping relegation last season, Saul Nelson’s men would have been keen to start this campaign on the front foot and they do have the opportunity to respond immediately when they travel to newly promoted Birmingham and Solihull. Old Reds won just once away from home last year while Birmingham and Solihull were pretty much faultless on their way to clinching the Midlands Premier title. The Bees lost on just one occasion and their home form this term could be crucial in their fight to stay in the division. Pete Glackin’s side fought well against Tonbridge Juddians last weekend, but suffered a narrow loss and with the club starting the season on -5 points due to fielding a player who had been sent off before he had appeared before a disciplinary panel last year, a win at Portway this weekend could be necessary. Two clubs who would like to forget the opening round of action meet this weekend as Worthing Raiders host newly promoted Guernsey. The Raiders were soundly beaten by Taunton, but Jody Levett did take a positive away from Somerset as Worthing picked up a point on their travels. Levett also stated that Guernsey won’t be any easy task as they also look to respond from a heavy defeat against Old Albanian. It was certainly a baptism of fire for Jordan Reynolds’s men on their National Two South debut and travelling to Roundstone Lane will be another test for island side this weekend.